Состоит из набора компьютеров , связанных друг с другом через общий коннект. Используется как единый универсальный компьютерный ресурс. В дальнейшем я буду использовать термин Linux Enterprise Cluster для описания его свойств и архитектуры. Some applications can be written using a cluster-aware application programming interface (API), a Message Passing Interface (MPI), or distributed objects. They will retain some, but not all, of the benefits of using the cluster as a single unified computing resource. But multiuser programs should not have to be rewritten to run inside a cluster if the cluster is a single unified computing resource. This book (and the artwork on its cover) inspired the Microsoft Wolfpack product name. Such as the Distributed Lock Manager discussed in Chapter 16. MPI is a library specification that allows programmers to develop applications that can share messages even when the applications sharing the messages are running on different nodes. A carefully written application can thus exploit multiple computer nodes to improve performance. This is assuming that they were already written for a multiuser operating system environment where multiple instances of the same application can run at the same time. These functions can be combined on a high-availability server pair that we will call the cluster node manager. The cluster node manager holds the master user account database (and uses NIS or LDAP to distribute user accounts to all nodes). The cluster node manager monitors the health of the cluster (using the Mon and Ganglia packages that will be discussed in Part 4); it is also a central print spooler (using LPRng). The cluster node manager can also offer a variety of other services to the cluster using the classic client-server model, such as the ability to send faxes. The Webmin and OSCAR packages both have methods of distributing user accounts to all cluster nodes that do not rely on NIS or LDAP, but these methods can still use the cluster node manager as the central user account database. A brief discussion of Hylfax is included near the end of Chapter 17. When a program runs, it is called a process. A process running on a Linux system is called a daemon. A daemon and the effects it produces is called a service. A service is called a resource when it is combined with its operating environment (configuration files, data, network mechanism used to access it, and so forth). A failover occurs when a resource moves from one computer to another. A proper failover or high-availability configuration has no single point of failure. I'm departing from the Red Hat cluster terminology here, but I am using these terms as they are defined by Linux-ha advocates (see http://www.linux-ha.org). In a cluster, all computers (called nodes) offer the same services. The cluster load balancer intercepts all incoming requests for services. It then distributes the requests across all of the cluster nodes as evenly as possible. 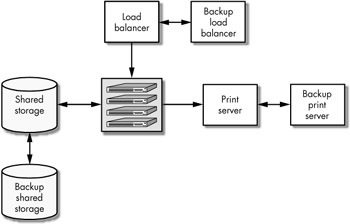 A high-availability cluster is able to failover the cluster load balancing resource from one computer to another. To be technically correct here, I need to point out that you can build a cluster without one machine acting as a load balancer for the cluster—see http://www.vitaesoft.com for one method of accomplishing this. How do Cluster Services Get Started? Using some other non-standard method (such as the Daemontools package). The Daemontools package is described in Chapter 8. The first line of this script starts the bash shell, and the second line causes whatever process identification number, or PID, is associated with this bash shell to be replaced with the snmpd daemon (the bash shell disappears when this happens). This makes it possible for init to run the script, find out what PID it is assigned, and then monitor this PID. If init sees the PID go away (meaning the snmpd daemon died), it will run the script again and monitor the new PID thanks to the respawn entry in the /etc/inittab file. The chkconfig program creates and removes the symbolic links used by init's servant, the /etc/rc.d/rc script. These symbolic links are the real way to enable or prevent a service from automatically running at a particular runlevel. As previously noted, all of the symbolic links for all system runlevels point back to the real scripts stored in the /etc/rc.d/init.d directory (actually, according to the Linux Standards Base, this directory is the /etc/init.d directory, but on Red Hat, these two directories point to the same files). Note that the snmpd daemon also supports a -f argument that accomplishes the same thing as the exec statement in this bash script. See the snmpd man page for more information. See http://www.linuxbase.org/spec for the latest revision to the LSB. Because /etc/init.d is a symbolic link to /etc/rc.d/init.d on current Red Hat distributions. Used like cron and at to start commands at a particular time, even on systems that are not running continuously. On Red Hat, the /etc/anacrontab file lists the normal log rotation cron job that is executed daily. If you disable this, you will no longer perform log rotation, and your system disk will eventually fill up. In Chapters 18 and 19, we will describe two methods of running cron jobs on all cluster nodes without running the crond daemon on all nodes (the cron daemon runs on a single node and remotely initiates or starts the anacron program once a day on each cluster node). Makes it possible to use a mouse to cut and paste at the text-based console. You should not disable this service. Incidentally, cluster nodes will normally be connected to a KVM (keyboard video mouse) device that allows several servers to share one keyboard and one mouse. Due to the cost of these KVM devices, you may want to build your cluster nodes without connecting them to a KVM device (so that they boot without a keyboard and mouse connected). Required to bring up the Ethernet interfaces and connect your system to the cluster network and NAS device. The Red Hat network configuration files are stored in the /etc/sysconfig directory. In Chapter 5, we will describe the files you need to look at to ensure a proper network configuration for each cluster node after you have finished cloning. This script uses these configuration files at boot time to configure your network interface cards and the network routing table on each cluster node. Cluster nodes will normally not act as NFS servers and will therefore not need to run this script. Some diskless clusters (or diskless workstations) will boot using the PXE protocol to locate and run an operating system (PXE stands for Preboot eXection Environment) based on the information provided by a PXE server. Running this service will enable your Linux machine to act as a PXE server; however, building a cluster of diskless nodes is outside the scope of this book. Only used on NIS client machines. If you do not have an NIS server, you do not need this service. One way to distribute cluster password and account information to all cluster nodes is to run an LDAP server and then send account information to all cluster nodes using the NIS system. This is made possible by a licensed commercial program from PADL software (http://www.padl.com) called the NIS/LDAP gateway (the daemon is called yplapd). Using the NIS/LDAP gateway on your LDAP server allows you to create simple cron scripts that copy all of the user accounts out of the LDAP database and install them into the local /etc/ passwd file on each cluster node. You can then use the /etc/nsswitch.conf file to point user authentication programs at the local /etc/passwd file, thus avoiding the need to send passwords over the network and reducing the impact of a failure of the LDAP (or NIS) server on the cluster. See the /etc/nsswitch.conf file for examples and more information. Changes to the /etc/xinetd.conf file are recognized by the system immediately (they do not require a reboot). Most server hardware now supports this. In the LVS-DR cluster described in Chapter 13, we will modify the routing table on each node to provide a special mechanism for load balancing incoming requests for cluster resources. An exception to this might be very large clusters that use a few cluster nodes to mount filesystems and then re-export these filesystems to other cluster nodes. Building this type of large cluster (probably for scientific applications) is beyond the scope of this book. See Chapter 10 for the reasons why. A more common application of the PXE service is to use this protocol when building Linux Terminal Server Project or LTSP Thin Clients. See Part IV of this book for more information. See also the mod_log_spread project at http://www.backhand.org/mod_log_spread. On older versions of Linux, and some versions of Unix, this is still called inetd. Usually used to distribute user accounts, user groups, host names, and similar information within a trusted network. This chapter has introduced you to the Linux Enterprise Cluster from the perspective of the services that will run inside it, on the cluster nodes. 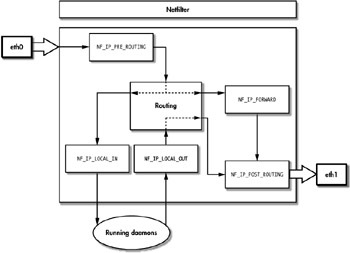 The normal method of starting daemons when a system boots on a Linux system using init scripts is also used to start the daemons that will run inside the cluster. The init scripts that come with your distribution can be used on the cluster nodes to start the services you would like to offer to your users. A key feature of a Linux Enterprise Cluster is that all of the cluster nodes run the same services; all nodes inside it are the same (except for their network IP address). When a packet from a client computer arrives on a Linux server, it must pass through the kernel before it is delivered to a daemon or service. If a service needs to failover from one server to another, the kernel's packet-handling methods must be the same on both servers. Resources can therefore be said to include kernel packet-handling methods and rules. This chapter also provides sample commands that demonstrate how you tell Netfilter to block packets before they reach the services on a Linux server; these commands can be used on the cluster load balancer and on all of the cluster nodes. These commands are normally not used when the cluster and its client computers sit behind a firewall, but they should be used on publicly accessible clusters (such as a web cluster) even when the cluster is protected by a firewall. Technically, they do not have to be exactly the same if the backup server is more permissive. They do, however, have to use the same packet marking rules if they rely on Netfilter's ability to mark packets. This is an advanced topic not discussed until Part III of this book. Netfilter uses the INPUT, FORWARD, and OUTPUT lists of rules and attempts to match each packet passing through the kernel. If a match is found, the packet is immediately handled in the manner described by the rule without any attempt to match further rules in the chain. If none of the rules in the chain match, the fate of the packet is determined by the default policy you specify for the chain. On publicly accessible servers, it is common to set the default policy for the input chain to DROP and then to create rules in the input chain for the packets you want to allow into the system. This used to be DENY in ipchains. Notice how a packet arriving on eth0 and going out eth1 will have to traverse the input, forward, and output chains. 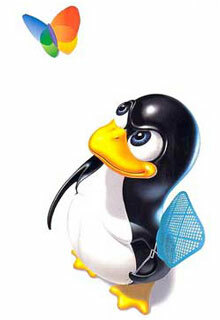 In Linux 2.4 and later series kernels, however, the same type of packet would only traverse the FORWARD chain. 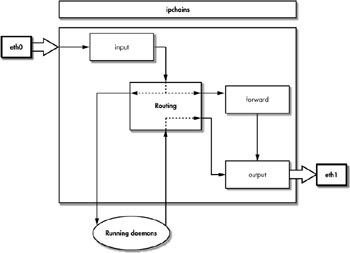 When using iptables, each chain only applies to one type of packet: INPUT rules are only applied to packets destined for locally running daemons, FORWARD rules are only applied to packets that arrived from a remote host and need to be sent back out on the network, and OUTPUT rules are only applied to packets that were created locally. 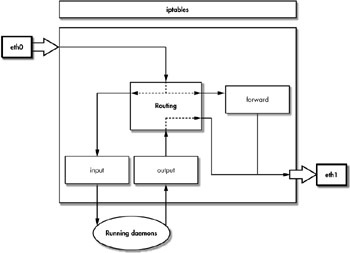 Figure 2-3 shows the iptables INPUT, FORWARD, and OUTPUT rules in Linux 2.4 series kernels. Up to the kernel 2.6 series at the time of this writing. This is true for the default "filter" table. However, iptables can also use the "mangle" table that uses the PREROUTING and OUTPUT chains, or the "nat" table, which uses the PREROUTING, OUTPUT, and POSTROUTING chains. The "mangle" table is discussed in Chapter 14. Recall from Chapter 1 that /etc/init.d is a symbolic link to the /etc/rc.d/init.d directory on Red Hat systems. However, if you save your rules using this method as provided by Red Hat, you will not be able to use them as a high-availability resource. If the cluster load balancer uses sophisticated iptables rules to filter network packets, or, what is more likely, to mark certain packet headers for special handling, then these rules may need to be on only one machine (the load balancer) at a time. If this is the case, the iptables rules should be placed in a script such as the one shown at the end of this chapter and configured as a high-availability resource, as described in Part II of this book. This is because the standard Red Hat iptables init script does not return something the Heartbeat program will understand when it is run with the status argument. For further discussion of this topic, see the example script at the end of this chapter. Marking packets with Netfilter is covered in Chapter 14. This would be true in an LVS-DR cluster that is capable of failing over the load-balancing service to one of the real servers inside the cluster. See Chapter 15. The first two commands assign the IP addresses and network masks to the eth0 and eth1 interfaces and cause the kernel to automatically add routing table entries for the 209.100.100.0 and 172.24.150.0 networks. The third command causes the kernel to send packets for the 192.168.150.0 network out the eth1 network interface to the 172.24.150.1 gateway device. Finally, the last command matches all other packets, and in this example, sends them to the Internet router. Like the Netfilter iptables rules, the routing rules do not survive a system reboot. To make your routing rules permanent, place them into a script (and add them to the boot process with chkconfig or ntsysv, as described in Chapter 1) or use the method provided by your distribution. # from the private network. # are allowing here is inbound connections on the eth0 interface). # (Sendmail and POP are running locally on this machine). # assume it should be sent to the Internet router. # Now that everything is in place we allow packet forwarding. # Remove our routing rules. echo "Requires start, stop or status"
The iptables' ability to perform network address translation is another key technology that enables a cluster load balancer to forward packets to cluster nodes and reply to client computers as if all of the cluster nodes were one server (see Chapter 12). This script also introduces a simple way to determine whether the packet handling service is active, or running, by checking to see whether the kernel's flag to enable packet forwarding is turned on (this flag is stored in the kernel special file /proc/sys/net/ipv4/ip_forward). The command service routing start would work on a Red Hat system. In Part II of this book, we will see why the word Running was used to indicate packet handling is enabled. To build the cluster described in this book, you do not need to use the ip command. Red Hat uses the network init script to enable routing rules. The routing rules cannot be disabled or stopped without bringing down all network communication when using the standard Red Hat init script. RFC 1918 IP address ranges will be discussed in more detail in Chapter 12. This script will also need to have execute permissions (which can be enabled with the command: #chmod 755 /etc/init.d/routing). So the Heartbeat program can manage this resource. Heartbeat expects one of the following: Running, running, or OK to indicate the service for the resource is running. 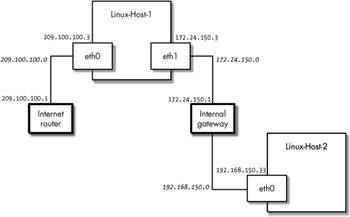 One of the distinguishing characteristics of a Linux Enterprise Cluster is that it is built using packet routing and manipulation techniques. As I'll describe in Part III, Linux machines become cluster load balancers or cluster nodes because they have special techniques for handling packets. In this chapter I've provided you with a brief overview of the foundation you need for understanding the sophisticated cluster packet-handling techniques that will be introduced in Part III. In this chapter I'll describe how to compile a Linux kernel. For many system administrators not familiar with Linux, this may sound like a risky thing to do on a server that will be used in production, but once you have done it a few times you'll understand one of the reasons why Linux is so powerful: you have complete control over the operating system. I could say a lot more about the benefits of having the source code of your operating system, but we'll save that for later. For now, we'll focus on what you need to be able to put your own Linux kernel into production. Set the options you want. gcc (check the README file included with the kernel source code to find out which version of the gcc compiler is required). Each kernel release should only be compiled with the version of gcc specified in the README file. You'll have to decide whether to use the "stock" version of the Linux source code or the kernel source code included with your distribution. Here are a few of the pros and cons of each method. You can apply your own patches to customize the kernel. It is supported by the entire kernel-development community. It allows more control over which patches are applied to your system. You can decide which kernel version you want to use. Con of using the stock kernel: It may invalidate support from your distribution vendor. It is usually supported by your distribution vendor (though the vendor may not support it if you recompile it with changes). It is known to compile. It is already running on your system. It has been tested by your distribution vendor and is likely to contain bug fixes that are not yet a part of the stock version of the kernel. You may not be able to apply kernel patches. It may have bugs introduced by your distribution vendor that are not found in the stock version of the kernel, and you may depend on your distribution vendor to fix them. If you use the kernel source code supplied by your vendor, you won't have many decisions to make when it comes to picking a kernel version to use; your distribution vendor will do that for you. However, if you decide to use the stock version of the kernel, you'll have to do a little more research to determine which kernel version to use. If you decide to download your own kernel, select an even-numbered one (2.2, 2.4, 2.6, and so on). Even-numbered kernels are considered the stable ones. Leave the CD-ROM mounted until you complete the next step. You should now have your shell's current working directory set to the top level directory of the kernel source tree, and you're ready to go on to the next step. For example, you can apply the hidden loopback interface kernel patch that we'll use to build the real servers inside the cluster in Part III of this book. Your actions here will depend upon whether you decide to install a new kernel, upgrade your existing kernel source code, or patch your existing kernel source code. When upgrading to a newer version of the kernel, you can copy your old .config file to the top level of the new kernel source tree and then issue the make oldconfig command to upgrade your .config file to support the newer version of the kernel. If you are upgrading your existing kernel source code, and this kernel source code was supplied by your distribution vendor, you should locate the .config file that was used to originally build the kernel you are currently running on your system. The distribution vendor may have left this configuration file in the top level of their kernel source distribution tree, or they may have a separate directory where they place a variety of .config files for different hardware architectures. This command will prompt you for any kernel options that have changed since the .config file was originally created by your distribution vendor, so it never hurts to run this command (even when you are not upgrading your kernel) to make sure you are not missing any of the options required to compile your kernel. In the top of the kernel source tree you'll also find a Makefile. You can edit this file and change the value of the EXTRAVERSION number that is specified near the top of the file. If you do this, you will be assigning a string of characters that will be added to the end of the kernel version number. Specifying an EXTRAVERSION number is optional, but it may help you avoid problems when your boot drive is a SCSI device (see the "SCSI Gotchas" section near the end of this chapter). You now need to set your kernel options regardless of whether you installed a new kernel, are upgrading your existing kernel source code, or are patching your existing kernel source code. One of the most important options you can select from within the make menuconfig utility is whether or not your kernel compiles as a monolithic or a modular kernel. When you specify the option to compile the kernel as a modular kernel (see "A Note About Modular Kernels" for details), a large portion of the compiled kernel code is stored into files in the /lib/modules directory on the hard drive, and it is only used when it is needed. If you select the option to compile the kernel as a monolithic kernel (you disable modular support in the kernel), then all of the kernel code will be compiled into a single file. Knowing which of the other kernel options to enable or disable could be the subject of another book as thick as this one, so we won't go into much detail here. However, if you are using a 2.4 kernel, you may want to start by selecting nearly all of the kernel options available and building a modular kernel. This older kernel code is likely to compile (thanks to the efforts of thousands of people finding and fixing problems), and this modular kernel will only load the kernel code (the modules) necessary to make the system run. Newer kernels, on the other hand, may require a more judicious selection of options to avoid kernel compilation problems. The best place to find information about the various kernel options is to look at the inline kernel help screens available with the make menuconfig command. These help screens usually also contain the name of the module that will be built when you compile a modular kernel. Modular kernels require more effort to implement when using a SCSI boot disk (see "SCSI Gotchas" later in this chapter). However, they are more efficient because they load or run only the kernel modules required, as they are needed. For example, the CD-ROM driver will be unloaded from memory when the CD-ROM drive has not been used for a while. Modular kernels allow you to compile a large number of modules for a variety of hardware configurations (several different NIC drivers, for example) and build a one-size-fits-all, generic kernel. To build a modular kernel, you simply select Enable Loadable Module Support on the Loadable Module Support menu when you run the make menuconfig utility. As a general rule, you should always enable loadable module support so you can then decide as you select each kernel option whether it will be compiled into the kernel, by placing an asterisk (*) next to it, or compiled as a module, by placing an M next to it. The .config file placed into the top of the kernel source tree is hidden from the normal ls command. You must use ls -a to see it. The sample-config file used in the previous command will build a modular kernel, but you can change it to create a monolithic kernel by disabling loadable module support. To do so, deselect it on the Loadable Module Support submenu. Be sure to enter the Processor Type and Features submenu and select the correct type of processor for your system, because even a modular kernel only compiles for one type of processor (or family of processors). See the contents of the file /proc/cpuinfo to find out which CPU the kernel thinks your system is using. Also, you normally should always select SMP support even if your system has only one CPU. Once you have saved your kernel configuration file changes, you are ready to begin compiling your new kernel. Packages such as VMware require loadable module support. If the make menuconfig command complains about a clock skew problem, check to make sure your system time is correct, and use the hwclock command to force your hardware clock to match your system time. See the hwclock manual page for more information. To compile your kernel, you first need to convert the kernel source code files into object code with the gcc compiler, using the make utility. If you are using the 2.4 kernel supplied with this book, start with the make dep command to build the kernel module dependencies. However, you can skip this step if you are compiling a kernel from the 2.6 series. Also, you must clean the kernel source tree regardless of which version of the kernel you are using, whether you are building a modular or monolithic kernel, or whether you are patching, upgrading, or compiling a new kernel. Use the make clean command, which will clean the kernel source tree and remove any temporary files that were left behind by a previous kernel compilation. Once the kernel source tree is clean, you are ready to tell the gcc compiler to build a new kernel with the make bzImage command; then, if you are building a modular kernel, you'll need to add the make modules and make modules_install commands to build and install the kernel modules into the /lib/modules directory. To store the lengthy output of the compilation commands in a file, precede the make commands with the nohup command, which automatically redirects output to a file named nohup.out. If you have difficulty compiling the kernel, you can enter each make command separately and examine the output of the nohup.out file after each command completes to try and locate the source of the problem. In the following example, all of the make commands are combined into one command to save keystrokes. If you see error messages at the end of this file, examine earlier lines in the file until you locate the start of the problem. If the nohup.out file does not end with an error message, you should now have a file called bzImage located in the /usr/src/linux/arch/*/boot (where * is the name of your hardware architecture). For example, if you are using Intel hardware the compiled kernel is now in the file /usr/src/linux/arch/i386/boot/bzImage. You are now ready to install your new kernel. The make modules_install command has already done part of this installation step, placing all of the modular kernel executables into a /lib/modules subdirectory based on the version number of the kernel. Now you just need to install the main part of the kernel by copying the kernel executable from the kernel source tree to a directory where your boot loader can find it at system boot time. Because boot loaders normally look for the kernel in the /boot directory, we'll place a copy of the kernel executable there. If the nohup.out file ends with an error, or if the bzImage file is not created, or if the /lib/modules subdirectory does not exist, try copying different versions of the .config file into place or use the make mrproper and make oldconfig commands to build a new .config file from scratch. Then rerun the make commands to compile the kernel again to see if the kernel will compile with a different .config file. You should also try turning on SMP support for your kernel through the make menuconfig command (if you are not already using one of the SMP .config files from your distribution). If the nohup.out file contains just a few lines of output, and you see error messages about the .hdepend file, try removing this temporary file (if you are using a 2.4 or earlier kernel), and then enter the nohup make dep clean bzImage modules modules_install command again. Or, if you cannot get a newer kernel to compile, try an older, more stable version from the 2.4 series. This should help you isolate the problem, at which point you can go online to find a solution. Try the comp.os.linux newsgroups (or comp.os.linux.redhat, dedicated to problems with Red Hat Linux). Also, see the Linux section at http://marc.theaimsgroup.com. Before posting a kernel compilation question to one of these newsgroups, read the Linux FAQ (http://www.tldp.org), the Linux-kernel mailing list FAQ (http://www.tux.org/lkml), and the Linux-kernel HOWTO. Your system may need a file called System.map when it loads a module to resolve any module dependencies (a module may require other modules for normal operation). Again, <version> in this command should be replaced with the kernel version you have just built. The /lib/modules subdirectory should be created when building a modular kernel. This method should at least get the kernel to compile even if it doesn't have the options you want. You can then go back and use the make menuconfig command to set the options you need. The System.map file is only consulted by the modutils package when the currently running kernel's symbols (in /proc/ksyms) don't match what is stored in the /lib/modules directory. The previous four steps are used to install any program, but the Linux kernel executable is part of the operating system, so we have to do a few additional things to cause the computer to recognize the kernel at boot time. If you are using a SCSI boot disk, see the "SCSI Gotchas" section later in the chapter. Both LILO and GRUB give you the ability at boot time to select which kernel to boot from, selecting from those listed in their configuration files. This is useful if your new kernel doesn't work properly. Therefore, you should always add a reference to your new kernel in the boot loader configuration file and leave the references to the previous kernels as a precaution. If you are using LILO, you'll modify the /etc/lilo.conf file; if you are using GRUB, you'll modify the /boot/grub/grub.conf file (or the /boot/grub/ menu.lst if you installed GRUB from source). You do not need to do anything to inform the GRUB boot loader about the changes you make to the grub.conf configuration file, because GRUB knows how to locate files even before the kernel has loaded. It can find its configuration file at boot time. However, when using LILO, you'll need to enter the command lilo -v to install a new boot sector that tells LILO where the configuration file resides on the disk (because LILO doesn't know how to use the normal Linux filesystem at boot time). The name / is given to the Linux root filesystem mount point. This mount point can be used to mount an entire disk drive or just a partition on a disk drive, though normally the root filesystem is a partition. (On Red Hat systems, Linux uses the second partition of the first disk device at boot time; the first partition is usually the /boot partition). Using the syntax LABEL=/ to specify the root filesystem is only possible when using Red Hat kernels. If you compile the stock kernel, you must specify the root partition device name, such as /dev/hda2. One final concern when specifying the root filesystem using GRUB is that the GRUB boot loader also has its own root filesystem. The GRUB root filesystem has nothing to do with the Linux root filesystem and is usually on a different partition (it is the /boot partition on Red Hat systems). see the /boot/grub/device.map file for the list of devices on your system. Again, this is the root filesystem used by GRUB when the system first boots, and it is not related to the root filesystem used by the Linux kernel after the system is up and running. To list all of the partitions on a device, you can use the command sfdisk -l.
Now you are ready to reboot and test the new kernel. If the system boots but does not have access to all of its devices, review the kernel options you specified in step 2 of this chapter. Once you can access all of the devices connected to the system, and you can perform normal network tasks, you are ready to test your application or applications. If you are using a SCSI disk to boot your system, you may want to avoid some complication and compile support for your SCSI driver directly into the kernel, instead of loading it as a module. If you do this on a kernel version prior to version 2.6, you will save yourself the trouble of building the initial RAM disk. However, if you are building a modular kernel from version 2.4 or an earlier series, you will still need to build an initial RAM disk so the Linux kernel can boot up far enough to load the proper module to communicate with your SCSI disk drive. (See the man page for the mkinitrd Red Hat utility for the easiest way to do this on Red Hat systems. The mkinitrd command automates the process of building an initial RAM disk.) The initial RAM disk, or initrd file, must then be referenced in your boot loader configuration file so that the system knows how to mount your SCSI boot device before the modular kernel runs. Also, if you recompile your 2.4 modular kernel without changing the EXTRAVERSION number in the Makefile, you may accidentally overwrite your existing /lib/modules libraries. If this happens, you may see the error "All of your loopback devices are in use!" when you run the mkinitrd command. If you see this error message, you must rebuild the kernel (before rebooting the system!) and add the SCSI drivers into the kernel. Do not attempt to build the drivers as modules and skip the mkinitrd process altogether. The /boot/grub/device.map file is created by the installation program anaconda on Red Hat systems. You gain more control over your operating system when you know how to configure and compile your own kernel. You can selectively enable and disable features of the kernel to improve security, enhance performance, support hardware devices, or use the Linux operating system for special purposes. The Linux Virtual Server (LVS) kernel feature, for example, is required to build a Linux Enterprise Cluster. While you can use the precompiled kernel included with your Linux distribution, you'll gain confidence in your skills as a system administrator and a more in-depth knowledge of the operating system when you learn how to configure and compile your own kernel. This confidence and knowledge will help to increase system availability when problems arise after the kernel goes into production.